LONDON’S Regent Hall was filled with Salvationists and friends to witness the installation of Commissioners Anthony and Gillian Cotterill as territorial leaders of the United Kingdom Territory with the Republic of Ireland by General Brian Peddle. There was a hush of holy anticipation as Commissioners Cotterill entered the hall behind the territorial flag while Croydon Citadel Songsters sang ‘Holy Spirit Rain Down’. The General and Commissioner Rosalie Peddle (World President of Women's Ministries) greeted the territorial leaders at the mercy seat where, together, they knelt in prayer before moving to the platform. The words of Isaiah 6:1-8, read by Colonel Sylvia Hinton (Territorial Secretary for Leader Development), were echoed in the congregational song ‘Holy, Holy, Holy’, before the Secretary for Personnel, Lieut-Colonel Beverley McCombe, offered prayer. In words of welcome and introduction the Chief Secretary, Colonel David Hinton, expressed his conviction that the Cotterills were appointed ‘for such a time as this’ and that God would bless their leadership. 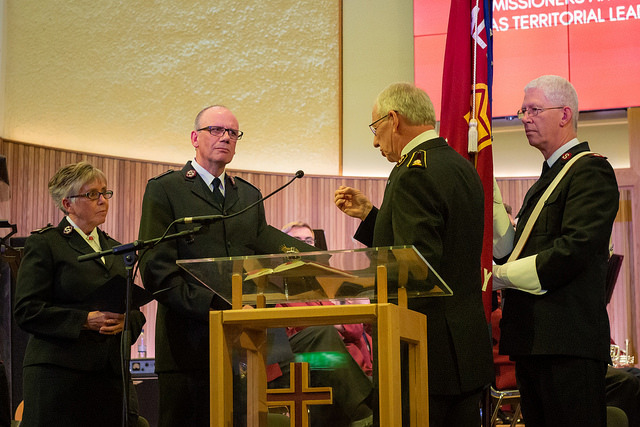 Reminding them of the responsibilities that are theirs, and of the covenant made as officers of The Salvation Army, the General called upon the Cotterills to exercise leadership ‘in a manner that is consistent with gospel values ... reflecting servant leadership as we see it in Jesus Christ’. In his message, the new territorial commander stressed that the Church is to be marked by the glory of God. ‘The essence surely is about ourselves, and then our work, being Christ-centred, revealing the nature of God, his radiance, his splendour.’ This happens, he said, ‘when we turn away from our own sin and allow the Spirit to move in and through us’. In response, people moved forward readily to pray, with extra chairs being used to extend the mercy seat. In her prayer after the closing song, Commissioner Peddle asked that God would ‘help us to be a bright light’ to share the love of Jesus in ‘a broken, hopeless world’. Many left the hall at the end of the meeting determined to fulfil that prayer and allow God’s glory to shine.